I suppose that the military has been looking for more remotely piloted aircrafts since the MQ-1 Predator, and it appears they have been going to colleges for their next one. They have given the University of Michigan a $10 million dollar grant to come up with a “six-inch robotic spy plane modeled after a bat”. I don’t know if the picture to the left here is their prototype, but you have to admit that it certainly looks neat. Not only is the COM-BAT (it’s official name?) designed for reconnaissance, but the military wants it to “gathers data from sights, sounds and smells in urban combat zones and transmit information back to a soldier in real time”. This means no more going into enemy territory as blind as a bat. Okay, that was a bad joke, but it was too hard to resist. However, if you had an infrared lens in that COM-BAT, you could send a whole fleet of these things in, and the people you’re spying on may be none the wiser. 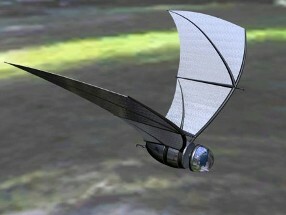 Believe it or not, this COM-BAT is planned to have energy scavenging potential, so it could be powered by wind and solar energy. That means it could stay in the air indefinitely, provided it has enough wind and sun. Other planned features are miniature microphones, as well as detectors for picking up nuclear radiation and poisonous gases. Well, if this project doesn’t work, then maybe Batman would be interested in it. Just one of those coming at the Joker could be enough to make even him frown. “Davidson’s legal travails began on January 16, 2005, when she told the U.S. Air Force that her husband Michael Severance, an airman, had been missing since the day before. Air Force investigators and the San Angelo Police Department began parallel investigations, which led them to conclude it was unlikely that Severance had deserted. Air Force Special Agent Greg McCormick did learn early on that Davidson owned a horse on a ranch, but investigators didn’t know where it was. In hopes that Davidson would lead them to it, Air Force agents placed a tracking device on the underside of her car in the middle of the night on February 26.
can you pass this on to your childrens children. no theres no escape from this earth, Biosphere I & 2 did not work it never well, Mother Nature is the only Place given by GOD in case you believe in Him. This is the Only ONE They found planets around a distant star but that lightyears away. Astronaut & Cosmonauts cant live long enough with out earth assistance.right or wrong? Please I plead to all the people of this world to wake up ,its you money, yes ,but you can direct the fund to better means not military and arms way.true to the saying if you live by the sword you die by the sword.what a true statement,history teach us those lesson,we people never learn,one scientist says that the future of mankind can survive thru outer planet exploration, so sorry it aint true, the way we act and behave, mankind will banish before that will happen, we are making our own destruction, not before long some body will push the SELF-DISTRUCT BUTTON,just for now they are still making that BUTTON.just wait, life is good here on Mother Earth is GREAT only if we keep it LIVABLE. GOT THE MESSAGE? thank you for reading this far.